JANUARY 2019 THE SHOP 51 idle properly. A PCV valve that is not functioning correctly, however, will in effect be an uncalibrated vacuum leak that can cause the engine to run lean at idle whenever the flow rate of the PCV valve is too high for the needs of the engine. The original equipment or stock PCV valve works quite well with the specific engine package it was designed for, but due to part number consolidation, many of the aftermarket replacement PCV valves do not have the same flow rate as the original. If any performance modifications have been made that change the vacuum characteristics of the engine, or if the stall speed of the torque convertor is causing low engine vacuum at idle when the transmission is in gear, the PCV valve flow rate may not match the needs of the engine. We have been using PCV valves that were designed for an engine with a hot cam such as a Boss 302 Ford or a Chev- rolet Z/28 for many engines that we have tuned. The brand of PCV valves we have been using are sold by Standard Motor Products. Part #VC188 is the PCV valve we use most on an engine with a hot cam or any engine with below 12- to 14-inches of vacuum at idle (in gear if the engine is equipped with an automatic trans- mission). The PCV valve should be in the low- flow position at idle, including when the engine is in gear if it is equipped with an automatic transmission. If the PCV valve is pulsing from the low-flow to the higher-flow position at idle speed, it will cause idle quality problems. 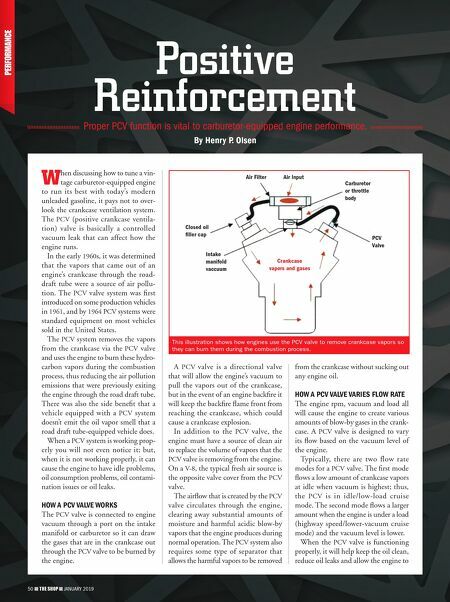 The disadvantage of using a low-flow PCV valve is that it may not flow enough for an engine that has a lot of blow-by. 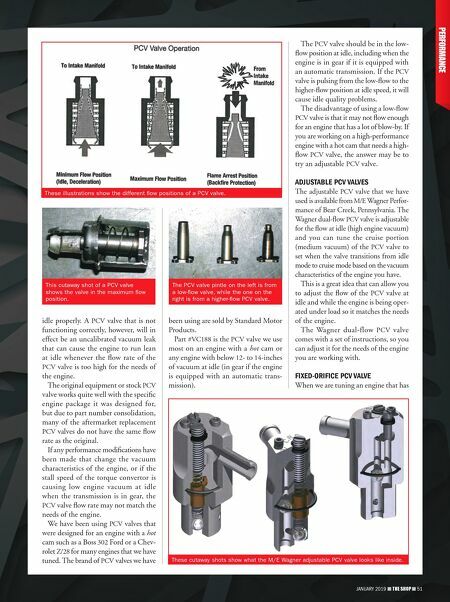 If you are working on a high-performance engine with a hot cam that needs a high- flow PCV valve, the answer may be to try an adjustable PCV valve. ADJUSTABLE PCV VALVES The adjustable PCV valve that we have used is available from M/E Wagner Perfor- mance of Bear Creek, Pennsylvania. The Wagner dual-flow PCV valve is adjustable for the flow at idle (high engine vacuum) and you can tune the cruise portion (medium vacuum) of the PCV valve to set when the valve transitions from idle mode to cruise mode based on the vacuum characteristics of the engine you have. This is a great idea that can allow you to adjust the flow of the PCV valve at idle and while the engine is being oper- ated under load so it matches the needs of the engine. The Wagner dual-flow PCV valve comes with a set of instructions, so you can adjust it for the needs of the engine you are working with. FIXED-ORIFICE PCV VALVE When we are tuning an engine that has JANUARY 2019 THE SHOP 51 These illustrations show the different flow positions of a PCV valve. This cutaway shot of a PCV valve shows the valve in the maximum flow position. The PCV valve pintle on the left is from a low-flow valve, while the one on the right is from a higher-flow PCV valve. These cutaway shots show what the M/E Wagner adjustable PCV valve looks like inside.